The place was fully stocked and fully manned with soda jerks, all wearing black t-shirts that said "Jerk" in big letters and paper hats. (You can buy the shirts and hats if you wish.) The shelves held local producers like North Fork Chips, McClure's Pickles, Rick's Picks and other things. And the old wooden drawers that once held pills are now filled with candy like Lemonheads and Double Bubble gum. 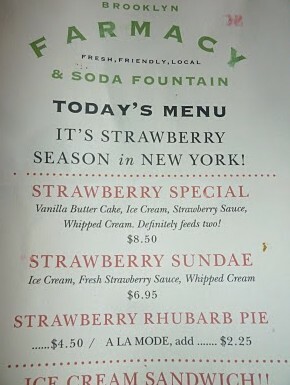 The menu (above and below) is simple and features ice cream, sundaes, ice cream sodas, black & whites, shakes, sparkling sodas and, or course, egg creams.